We are engaged in offering an extensive range of Ladies Long Boots in brown color. These Shoes are manufactured using very superior and premium quality raw material. 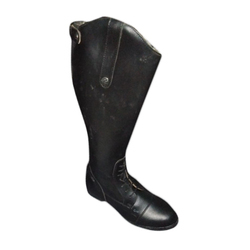 Our Long Boots can be availed at most competitive prices. Leather Riding Boots for Dressage Equation with zippers at the back and elastic full grain soft leather upper and sheep skin lining - TPR SOLE. We are offering Riding Shoes. These are the top quality riding shoes, which are liked by all age group community. These are made from very high quality raw material which ensures high durability. Our assortment of riding shoes are available at market leading prices. - Natural Leather with wax Finish. - Sued Leather Seat leather seat. In order to meet excellent quality standards, we are supplying Horse Riding Shoes. We are manufacturer, supplier and exporter of Horse Riding Shoe (6003). These Horse Riding Shoe (6003) can be manufactured using high quality raw materials and can be customized as per client's specification's. 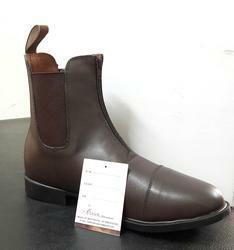 Jodhpur Riding Boots, Upper Cow Softy, Leather Lining, Neolite Sole.